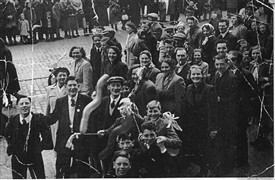 The miners gala-day in Edinburgh approximately 1948. People from Addiewell enjoying the day! Some people who are in this photograph include Mrs Lindsay, Mrs Johnstone, Mrs Curran, Mrs Robb, Mrs Cairney, Hughie Cairney Junior, Hughie(Chic) Cairney, John Cosgrove and the children at the front Jack Curran, Pat and Billy Kane, Hughie and Andrew Johnstone. 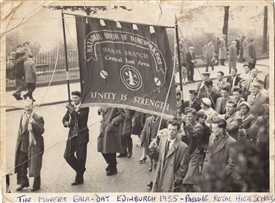 The BAADS mine banner at the miners gala-day in Edinburgh 1955. Some of the people in it are: James (Juicy)Kane, Rab McInally, Jack Curran, Pat Kane, Jimmy Sibbald, Mrs Bann, Ross McMahon, Mrs Ross McMahon, Andrew Meek, Pat Crossan, Alec Irvine, Billy Kane, Peter Irvine, May Meek, Jakie Muirhead, Dan Lindsay, James Quinn, John(Ja)Foley and Eddie Lawless. This photo is currently on display in Loganlea Miners Welfare. 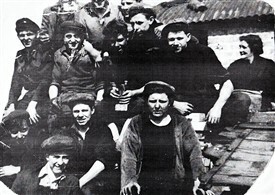 Surface Workers at Loganlea Pit in 1954. 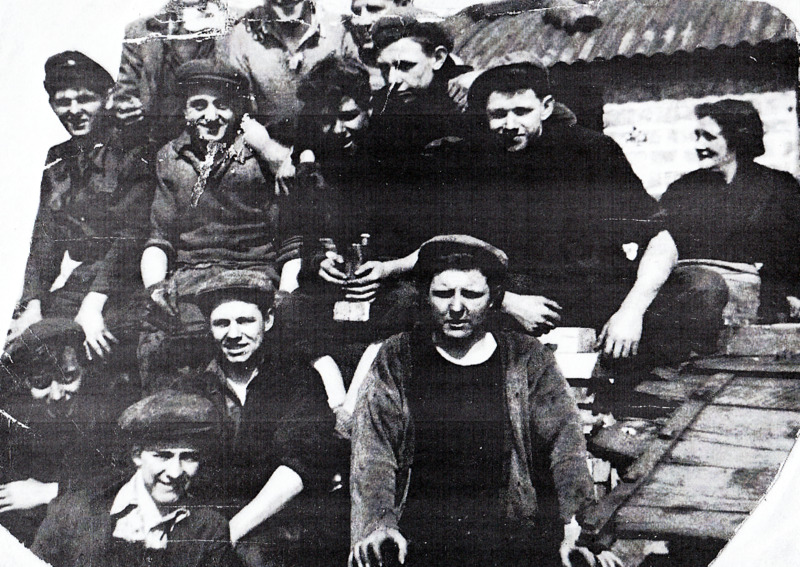 Among the workers are Tommy Singleton, David (Dadle) Queen, Rab Mcnally, John Kelly, Tommy (Toss) Curran, Hughie Mark, Wullie Hilson, Wullie Mulligan, Sarah Thomson. 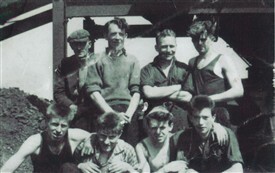 This picture was donated to West Lothian History Dept. many years ago by John Kelly. John Kelly donated this picture many years ago to West Lothian History Library. Back Row L to R Jock Meek, Frank Rafferty, Paddy Galvin, Billy Forrester, Front row L to R Stuart Shanks Rab Pryde Bernard Curran Billy Kane. All the people in these would have been at the Miners Gala most years or every year. 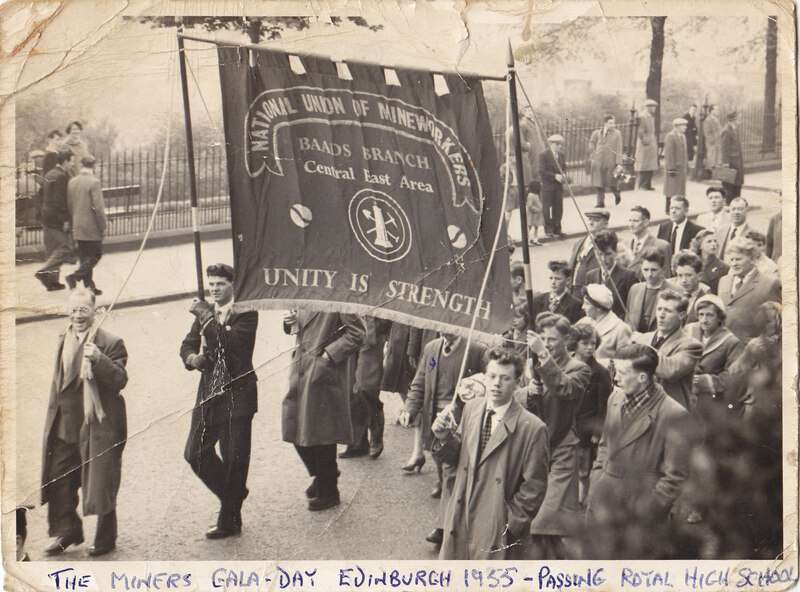 The miners' gala in Edinburgh started in 1947 (the year the pits were nationalised). Buses would run from Addiewell and Loganlea, representing Baads Mine-Loganlea Pit. This gala became an annual event and was a day not to be missed and was the highlight of the year for the Scottish Labour Movement. The day started with the assembly of the parade at Hillside Crescent (the headquarters of the Scottish Area N.U.M.for many years). It then proceeded up Leith Street, then down by the Royal High School to Holyrood Park. The parade was made up of all sections of the trade union movement (Railwaymen, Steelworkers, Postal Workers, etc.) along with the Miners, and all their banners. When you add in the pipe bands, brass bands and all the other bands in attendance, along with the families participating,it was a truly impressive display of working class solidarity. When the parade reached Holyrood Park, there were speeches by Trade Union leaders and prominent members of the Labour Movement. Over the years there were appearances from some wonderful people, like the great American singer-actor-political activist, Paul Robeson. Then the sports programme started, with athletics, football, boxing and tug of war. I remember one of my friends from Loganlea won the heavyweight boxing title - John Toner. 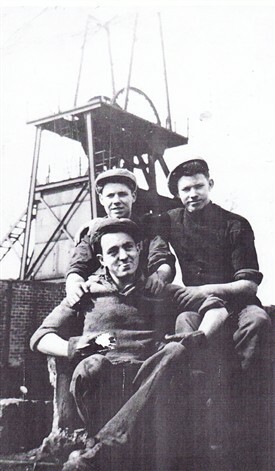 Another Dykes man (Tom Yardley) won an athletics event, and of course the football was always an attraction for me, and I remember seeing the great Alec Young playing for the Scottish Miners - what a player! At its height the Gala could attract 100,000 people. It was a truly magnificent day and I went to it every year for many years. Great Memories. What are your memories ? Send them in. This page was added by Billy Kane on 02/06/2013. Hi Billy, Very interesting! I have many memories of past miner's gala days when I was growing up in Kirkhill Cottages and Loganlea Road in the 60s & 70s. The gala day was one of the highlights of the year along with the miner's trips to Burntisland, Portobello and Ayr.